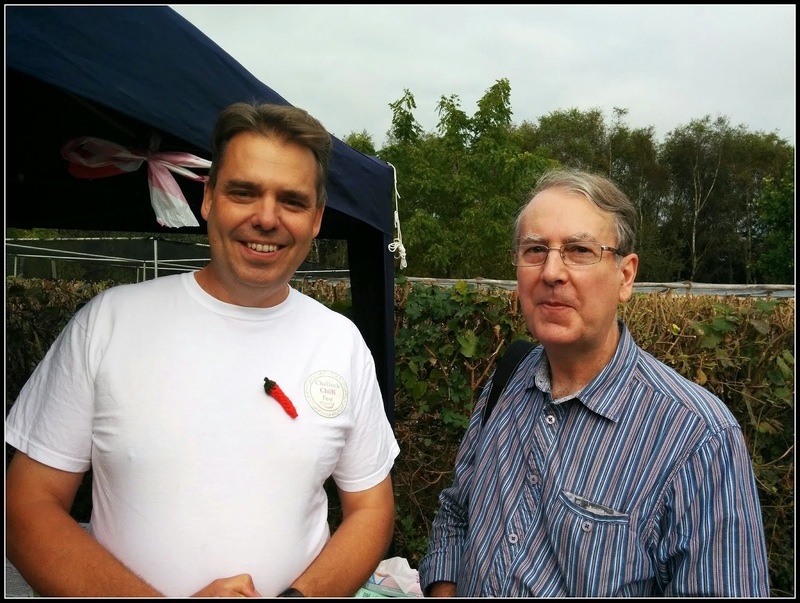 At the weekend I had the privilege of attending the Challock Chilli Fest, a chilli-themed event hosted by Stephen Shirley, the owner of Victoriana Nursery Gardens and his family / team. On view this past weekend were 80 different varieties of chilli, all grown on-site, in a plastic poly-tunnel. Looking at this photo of Stephen and me, you would think I had just eaten one of those hot, hot chillis! Actually, it was a hotdog from Cafe Mauresque made with Merguez sausage, with yogurt with mint and harissa - which was absolutely delicious! In fact there were lots of edible goodies on sale. For instance these potato crisps with chipotle chilli flavouring from Kent Crisps. And this Indian Lime Pickle and Hot Mustard Pickle (aka "Piccalilli") from "Jane's Country Larder". Stephen's chilli plants were mostly a lot bigger than mine. The reason for this is of course that his are grown in a polytunnel, whereas mine are out in the open. As it happens, this suits me fine. I couldn't afford the space in my little garden for plants as enormous as Stephen's ones anyway (although he was trying to persuade me to install a polytunnel!). Many gardening books assert that growing chillis outdoors is not worthwhile in the UK. They are wrong. I have done it for years, and I usually get a pretty good crop. You just have to start them off indoors and only put them outside when the weather warms up in the Spring. Chillis do take a long time to grow to maturity though, so the key to success is to start them off early (Jan / Feb in the UK), as long as you have a suitable place to keep them warm and provided with enough light. Regular readers of my blog know full well that for a long while I have been interested in growing chillis. Well, after our visit to Challock at the weekend I'm upgrading that: I'm now officially "obsessed"! My harvest this week has as usual not been big, but varied. In the basket this time are Beetroot, Runner Beans, Chillis, Peppers, Lettuce, Cucumbers, Tomatoes and one solitary French Bean. The Lettuce are "Webbs Wonderful", an Iceberg type. I was only able to use the hearts because the outer leaves had been extensively nibbled by slugs. Here's a tip for separating the leaves of a tight lettuce like this (and Little Gem / Romaine types too): do it under a running tap. The water gets under the leaves and lifts them apart gently so they don't tear. The two tomatoes you see in the basket are "Maskotka", the first ripe ones from a small second crop on my two plants of this variety. They avoided the blight which took down the bigger varieties, and made it through the compost contamination saga better than any of the others, and now they are producing a second crop. I think you can understand why this is my favourite tomato variety! Saturday produced this modest yield - some more chillis and a handful of "Cobra" French Beans. This is my entry for the Harvest Monday blog-hop, hosted as ever by Daphne's Dandelions. I'm so pleased with these carrots. For the first time ever I have a crop of carrots that have completely escaped the ravages of the Carrot Root Fly. The covering barrier of Enviromesh has done its job admirably. They are mostly "Early Nantes", by the way. The "Toledo" Leeks, likewise, have been better than I had dared to hope for. They are really densely-packed and strongly-flavoured. This is my first little batch of Brussels Sprouts for the year. They are few, and not very big, but we just wanted them! Sprouts are probably Jane's favourite vegetable. I know that they would have grown bigger if left for longer, but this year I have enough plants to justify picking some early - young and delicious. By the way, these ones are of the variety "Brilliant". 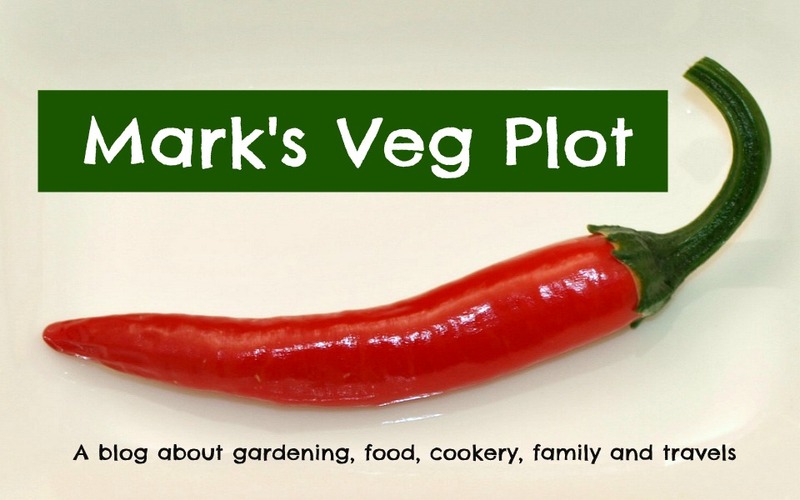 What vegetables come to mind when you are asked to name typically British vegetables? I think I would have to add to the ones above the Parsnip, the Cabbage and the Swede Turnip. They are all ones that I associate with late Autumn or Winter - ones that go well in or with a hearty casserole! This is the so-called "Gourmet Salad". Close inspection reveals that it contains (at least) Lettuce, Rocket, Red Mustard, Mizuna, and Pak Choi. As you can see, the leaf-miners have found the Mizuna, but so far the other plants look unscathed. Unfortunately the Rocket has already begun to bolt, but that seems to happen a lot when it is crowded as it is here. It looks a bit sparsely-populated, because despite the application of blue slug-pellets, the blessed slugs have still managed to penetrate the defences! Growing salads in seed-trays and pots like this is a good way to do it when Winter is approaching, because you can easily move the plants under cover in a cold-frame or greenhouse if you need to. It's late September, and at this time of year I usually have a fair few tomatoes ripening on the Dining Room table and windowsill - ones I have brought indoors either to avoid blight or because the weather has turned cool and I think they will ripen better inside than out. That photo is from 2013, and shows just the "last few" of what was undoubtedly a bumper crop. For reasons already known to my regular readers, this year the harvest is an awful lot smaller! They look like plum tomatoes, don't they? They aren't though. They are mostly the "Orkado" ones, which ought to be round. Still, at this point in time I'm grateful for ANY ripe tomatoes! I really do hope the last of the big "Larisa" beefsteaks (seen below, top right) ripens nicely and doesn't develop the dreaded disease. Do you see the four "Nosferatu" chillis at the bottom right corner too? I am trying to ripen them fully before putting them with the rest of the chilli crop in the airing-cupboard, where they are drying prior to being made into flakes. I have also frozen some for use during the Winter. Now that Autumn is with us, my Endives, which struggled even to survive during the Summer, have taken off and are looking really nice. I know that many of my readers think that Endive and Chicory / Radicchio is too bitter (though of course that is a matter of personal preference), but I have an answer to this: blanch the Endive. Blanching (literally "making white") means to exclude light, thus making the plant pale. Don't ask me why, but pale leaves are sweeter. Does chlorophyll taste bitter?? Blanching of Endives can be achieved in a number of ways. In France, where Endives are very popular, commercial growers often use purpose-made Endive-blanchers that are shaped like a domed dinner-plate. The blancher is simply placed on top of the growing plant. You can also get blanchers that are a bit like Rhubarb-forcers, normally made of terracotta, that look like tall upside-down flower-pots. However, you can achieve much the same effect with a piece of string! This is my technique: on a dry day (wet foliage rots quickly), gather all the leaves of the Endive together and tie a piece of soft string around the outside, not too tightly, but firmly enough to keep the leaves in place. I normally secure the string with a bow knot, so that I can easily untie it to adjust the tension if necessary. Apart from watering occasionally if necessary, all you have to do now is wait. Wait for about a week to ten days, by which time the inner leaves will be a pale yellow colour, at which point you cut off the plant at its base, discard the outer leaves, and eat the inner ones in your salad. During the blanching period I sometimes untie the string briefly, just to check progress, and to remove any leaves that have rotted or gone mildewy - which can happen if the plant is wet and/or if the temperature is too high. My method is better for avoiding fungal growths than containing the whole plant in a pot-like Endive-blancher, because it allows better ventilation. This next photo shows an overhead view of a plant that has been tied. Of course this photo is of an immature plant, which is not yet ready for tying, but at least it demonstrates the star-shaped structure of the plant so that you can better understand how the tying-up operation works. There are few things that gladden my eye more than a basket full of ripe chillis! The dry, warm weather in the early half of this month has brought the chillis on a lot, and their fruits are now reaching maturity. This year maturity equates to turning red. I like chillis in all shapes, sizes and colours, but for me the most attractive ones are red. I'm not sure why. I feel the same about tomatoes. I know it sounds old-fashioned, but I also like carrots to be orange, and beetroot to be purple too! And the two in the middle (one round, one long and curved) are "Piment d'Espelette". The round one is a real aberration, probably caused by the compost issues I had. Piment d'Espelette is supposed to be long and fairly straight! Anyway, it looks good, doesn't it? If you didn't know what it was you might say it was a "Cherry Bomb" or something similar. This year I have only one chilli that will not be red when mature, and this is "Aji Limon", which will hopefully be yellow. No sign of that yet though. The immature fruits of "Explosive Embers" are purple, but even they turn red when they ripen, passing through a number of other colours en route. And of course the "Nosferatu" chillis are a lovely deep purple-ey black when they are immature. Today though, the chillis I have picked are definitely RED!